We need to answer a question that is asked in Scripture. Proverbs 30:4 Who established all the ends of the earth? What is His Name, and what is His Son’s Name, if you know it? This lesson will reveal a very special treasure that is being restored in these last days. It’s mentioned over 7,000 times in Scripture! Read these two verses from the King James version (KJV) and then we’ll talk about it. The LORD is not a name; it’s a title. So what is His name? Most people say they don’t know or remember his personal name. His Holy Name is (the Hebrew letters Yod, Hey, Waw, Hey). This corresponds to the English letters YHWH. Therefore, most Hebrew scholars pronounce His Holy Name as Yahweh and Yah H3050 is the short form of His Name. Exodus 20:7 Thou shalt not take the name of YHWH thy God in vain; for YHWH will not hold him guiltless that taketh his name in vain. The Hebrew word shav H7723, translated as vain, means to bring it to nothingness or destroy through falsehood. This is exactly what translators did when they took His name away and replaced it with the generic titles (in all caps) LORD H3068 & GOD H3069, while these same titles were also being used by pagans like Buddhists, Muslims, Greeks, etc. to honor their “gods”. Micah 4:5 For all people will walk every one in the name of his god, and we will walk in the name of YHWH our God for ever and ever. His name should always be set apart from pagans and not given to another. Isaiah 42:8 I am YHWH: that is my name: and my glory will I not give to another, neither my praise to graven images. Let me explain why this is so important with a true story. A friend of mine used the titles LORD & GOD. until one day He was hired to set up some sound equipment. The people he was working for kept saying, “Praise the lord! Praise god!” He responded, “Yeah, Praise GOD.” Later, they put a big golden Hindu idol on the stage and my friend said, “No! I wasn’t praising that lord! I worship Yahweh.” He now sees the importance of YHWH’s name. Isaiah 47:4 As for our redeemer, YHWH of hosts is his name, the Holy One of Israel. For this reason, we’ve also returned to using the original Hebrew titles AdonaiH136 instead of “Lord” and ElH410 & ElohimH430 instead of “God”. These titles are ok to use, but not to take away His personal name. Some say His Name is too holy to be uttered, but as shown in the e-Sword below YHWH says His name is to be declaredH5608 (written, spoken, told, etc.). Psalm 83:18 That men may know that thou, whose name alone is YHWH, art the most high over all the earth. We love Yahweh's name and desire to honor Him with our lives and our lips. When you have a very close friend, you call them by name, not only by a title, right? Would you say Hi boy, Hi girl, Hey kid, or Hello Mister to someone who is a close friend? No, you’d call them by their name. Some people say that it doesn’t matter, but the Scriptures on this subject prove that it does matter. It is all about a loving relationship. We also want to honor our blessed Messiah’s name. We called Him Jesus for a long time, but we now know His Hebrew birth name is Yahoshua. Matthew 1:21 And she shall bring forth a son, and thou shalt call his name YAHOSHUA: for he shall save his people from their sins. YHWH means the one who exists and causes existence. Yah is the short form of YHWH and has the same meaning. AhaYah, translated as I AM, also has the same meaning as YHWH. Hallelu Yah is 2 Hebrew words. It’s a call for you to Praise Yah. Yeshua means salvation and is the short form of Yahoshua. Yahoshua means Yah is my (Yeshua) salvation. Joshua, son of Nun, in the Tanakh actually had this same name, Yahoshua, and was also called Yeshua. Just as he brought the children of Israel from the wilderness into the promised land, Messiah Yeshua, our deliverer, is coming and He will never break his promise. Now, let’s see what Yeshua said about His own name. As he rode into Jerusalem on a donkey, what did the people say? Matthew 21:9 And the multitudes that went before, and that followed, cried, saying, Hosanna to the Son of David: Blessed is he that cometh in the name of YHWH; Hosanna in the highest. This was a fulfillment of prophecy as they were directly quoting Psalms. Psalm 118:26 Blessed be he that cometh in the name of YHWH: we have blessed you out of the house of YHWH. Zephaniah 3:9 For then will I turn to the people a pure language, that they may all call upon the name of YHWH, to serve him with one consent. Hebrew was basically a dead language until 1881 when Eliezer Ben Yehuda began restoring it as an everyday language. Yeshua said that we’d cry out that same Psalm again at His return. We are now able to fulfill this prophecy! Matthew 23:39 For I say unto you, Ye shall not see me henceforth, till ye shall say, Blessed is he that cometh in the name of YHWH. Amen! There’s another prophecy that’s quoted a couple times in the Brit Chadesha. Joel 2:32 And it shall come to pass, that whosoever shall call on the name of YHWH shall be deliveredH4422 for in mount Zion and in Jerusalem shall be deliverance, as YHWH hath said, and in the remnant whom YHWH shall call. Many times the Scripture talks about singing and praising YHWH’s name. Hebrews 2:12 quotes Yeshua Saying, I will declare thy name unto my brethren, in the midst of the assembly will I sing praise unto thee. Psalm 113:1-6 Praise ye Yahweh. Praise, O ye servants of Yahweh, praise the name of Yahweh. Blessed be the name of Yahweh from this time forth and for evermore. From the rising of the sun unto the going down of the same Yahweh's name is to be praised. Yahweh is high above all nations, and his glory above the heavens. Who is like unto Yahweh our Elohim, who dwelleth on high, 6 Who humbleth himself to behold the things that are in heaven, and in the earth! Psalm 145:21 My mouth shall speak the praise of YHWH: and let all flesh bless his holy name for ever and ever. As you see, His name is not only declared a lot in Scripture; it’s magnified. John 4:23-24 But the hour cometh, and now is, when the true worshippers shall worship the Father in spirit and in truth: for Abba seeketh such to worship him. El is a Spirit: and they that worship him must worship him in spirit and in truth. He’s calling us out of our ways into His truth. His Word is the final authority. In summary, we honor YHWH & Yeshua’s names because of love. Read below what Isaiah 56:6-7, says about those who love His name. It’s a blessing to honor Him. We have a lot of Scriptures to share with you on this subject that are listed below. YHWH’s name alone appears over 7,000 times in the Scriptures. 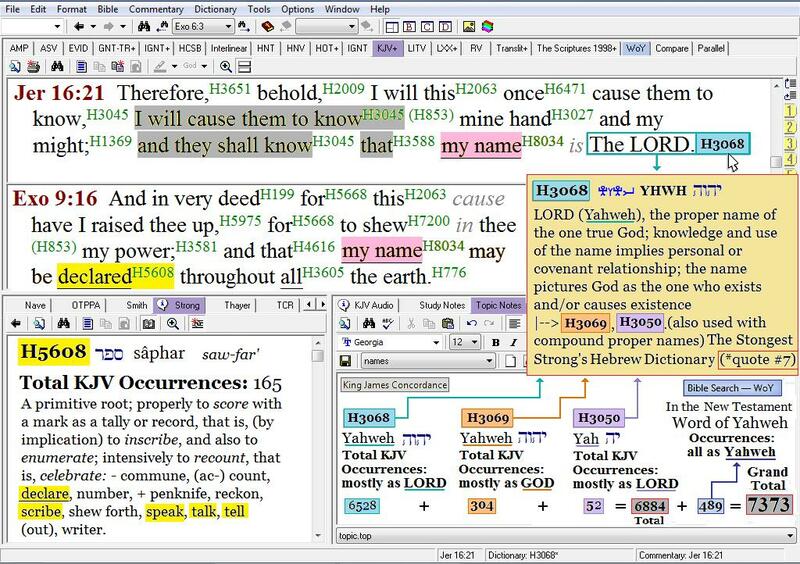 The picture below is a screenshot of e-Sword Bible software study on Yahweh's name. Then below the picture, there are a few more very important passages to further your study into honoring His name. What do you think is the true name of the heavenly Father? What do you think is the true name of the Messiah? Included below is a listing of the books of the Bible along with the Hebrew transliterations of the books that have Hebrew names. Isaiah 56:4-7 For thus saith Yahweh unto the eunuchs that keep my sabbaths, and choose the things that please me, and take hold of my covenant; Even unto them will I give in mine house and within my walls a place and a name better than of sons and of daughters: I will give them an everlasting name, that shall not be cut off. Also the sons of the stranger, that join themselves to Yahweh, to serve him, and to love the name of Yahweh, to be his servants, every one that keepeth the sabbath from polluting it, and taketh hold of my covenant; Even them will I bring to my holy mountain, and make them joyful in my house of prayer: their burnt offerings and their sacrifices shall be accepted upon mine altar; for mine house shall be called an house of prayer for all people. Ezekiel 39:7 So will I make my holy name known in the midst of my people Israel; and I will not let them pollute my holy name any more: and the heathen shall know that I am Yahweh, the Holy One in Israel. Psalm 69:35-36 For Yahweh will save Zion, and will build the cities of Judah: that they may dwell there, and have it in possession. The seed also of his servants shall inherit it: and they that love his name shall dwell therein. Deuteronomy 5:11 Thou shalt not take the name of Yahweh thy Elohim in vain: for Yahweh will not hold him guiltless that taketh his name in vain. Psalm 124:8 Our help is in the name of Yahweh, who made heaven and earth. Psalm 135:1-3 Praise ye Yahweh. Praise ye the name of Yahweh; praise him, O ye servants of Yahweh. Ye that stand in the house of Yahweh, in the courts of the house of our Elohim, Praise Yahweh; for Yahweh is good: sing praises unto his name; for it is pleasant. Proverbs 18:10 The name of Yahweh is a strong tower: the righteous runneth into it, and is safe. Exodus 34:5-7 And Yahweh descended in the cloud, and stood with him there, and proclaimed the name of Yahweh. And Yahweh passed by before him, and proclaimed, Yahweh, Yahweh Elohim, merciful and gracious, longsuffering, and abundant in goodness and truth, Keeping mercy for thousands, forgiving iniquity and transgression and sin, and that will by no means clear the guilty; visiting the iniquity of the fathers upon the children, and upon the children's children, unto the third and to the fourth generation. Psalm 7:17 I will praise Yahweh according to his righteousness: and will sing praise to the name of Yahweh most high. Romans 10:9-13 That if thou shalt confess with thy mouth Master Yeshua, and shalt believe in thine heart that Yahweh hath raised him from the dead, thou shalt be saved. For with the heart man believeth unto righteousness; and with the mouth confession is made unto salvation. For the scripture saith, Whosoever believeth on him shall not be ashamed. For there is no difference between the Jew and the Greek: for the same Master over all is rich unto all that call upon him. For whosoever shall call upon the name of Yahweh shall be saved. Psalm 20:5-7 We will rejoice in thy salvation, and in the name of our Elohim we will set up our banners: Yahweh fulfil all thy petitions. Now know I that Yahweh saveth his anointed; he will hear him from his holy heaven with the saving strength of his right hand. Some trust in chariots, and some in horses: but we will remember the name of Yahweh our Elohim. Revelation 14:1 And I looked, and, lo, a Lamb stood on the mount Zion, and with him an hundred forty and four thousand, having his name and his Father's name written in their foreheads. I hope that these Scriptures have encouraged you in your walk with Yahweh concerning His holy set apart name. As you can see, the Messiah's name is also important. May your studies be blessed!